Raw shooting on the iPhone XS has been improved and it's all thanks to this smart app update. The iPhone XS camera is one of the best around on a camera phone at the moment, but there is one small but significant issue. While shooting Raw files is very much a thing on the handset, according to the makers of Halide, a camera app for the iPhone, it's a little bit trickier to get the quality you want in this file format, because of the HDR trickery used to enhance the images. In a brilliant blog post - we urge you to read the whole thing if you are interested in the ins and outs of camera phone technology - it cites a concern with Raw files as the way they are processed are a lot different than how it worked in the iPhone X. "The iPhone X exposed for 1/60th of a second at ISO 40 whereas the iPhone XS exposed for 1/120th of a second at ISO 80. We suspect the XS camera now just prefers shorter exposure times at higher ISO, to get the best possible Smart HDR photo' notes the post. "We make a camera app that takes Raw photos, so this is very bad. Not only does Raw not benefit from merging multiple photos, but iPhone photos generally get very noisy above ISO 200. This is a major step in the wrong direction." All is not lost, though, as Halide has created an update to its app to make sure that Raw files work as they should with the iPhone XS camera. And it has done this by by-passing most of the software smarts built into the camera. 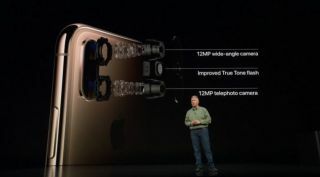 "A new feature in Halide 1.10 is called Smart Raw, which uses the new sensor technology in the iPhone XS to get better images than an iPhone X could ever take," notes the blog. "Smart Raw does not use any aspect of Smart HDR – in fact, it avoids it altogether, so you end up with almost no noise reduction. The blog continues: "Thanks to specific fine-tuning for the iPhone XS sensor, we can now get more quality out of the camera than ever before. "There’s a remarkable increase in resolution and quality going from the iPhone X to the iPhone XS." It is this resolution that recently made the iPhone XS Max the second best camera phone around. The app update will be out in the next few days. Raw vs Jpeg: let the battle commence.